In 2017 only 2% of the surviving members of the 1996 cohort flowered! In 2017 only 7 plants flowered of the surviving 284 plants in the 1996 cohort. That means that 44% of the original plants are surviving and only 2% of the living individuals flowered! Five percent of living individuals flowered in 2016. In contrast, 45% of living plants flowered in 2015, followed by 37%, 34%, and 40% from 2014 back to 2012. We found that of the original 646 individuals, 284 were alive in 2017, only 7 fewer than last year. We are not sure why so few plants flowered this year. It’s possible that lack of fire in the plot influenced flowering rates. This plot was due for a prescribed burn in spring 2017, but weather and scheduling conflicts kept us from burning. 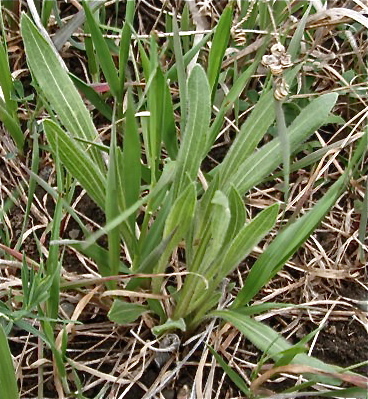 The 1996 cohort has the oldest Echinacea plants in experimental plot 1; they are 21 years old. They are part of a common garden experiment designed to study differences in fitness and life history characteristics among remnant populations. 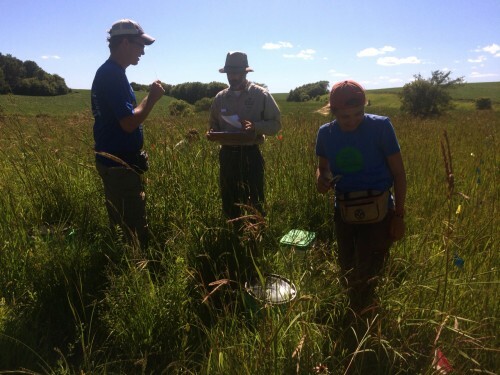 Every year, members of Team Echinacea assess survival and measure plant growth and fitness traits including plant status (i.e. if it is flowering or basal), plant height, leaf count, and number of flowering heads. We harvest all flowering heads in the fall, count all achenes, and estimate seed set for each head in the lab. We harvested 8 heads. At present, they await processing in the lab to find their achene count and seed set. The oldest Echinacea plants in experimental plot 1 are 20 years old. They are part of a cohort planted in 1996 in a common garden experiment designed to study differences in fitness and life history characteristics of remnant populations. Stuart sampled about 650 seeds (achenes) from eight remnant populations in and near Solem Township, representing the range of modern prairie habitat from small patches along roadsides to a large nature preserve. In 1996, he transplanted seedlings on a 1m x 1m grid, randomly assigning the location of each individual. Every year, members of Team Echinacea assess survival and measure plant growth and fitness traits including plant status (i.e. if it is flowering or basal), plant height, leaf count, and number of flowering heads. We harvest all flowering heads in the fall and obtain their achene count and seed set in the lab. Only 15 plants from the 1996 cohort were flowering this year. We were very curious to know if this small number was a result of a low rate of flowering or due to high mortality in the cohort. We found that of the original 650 individuals, 291 were alive in 2016, only 13 fewer than last year. That means only 5% of living individuals flowered. In contrast, 45% of living plants flowered last year (and 37% in 2014, 34% in 2013, 40% in 2012). We’re not sure why so few plants flowered this year; it’s possible that individuals flower less as they age, but we also observed low rates of flowering in younger cohorts in experimental plot 1, suggesting that environmental factors may also be responsible. We harvested all 17 heads and at present they await processing at the lab to find their achene count and seed set. 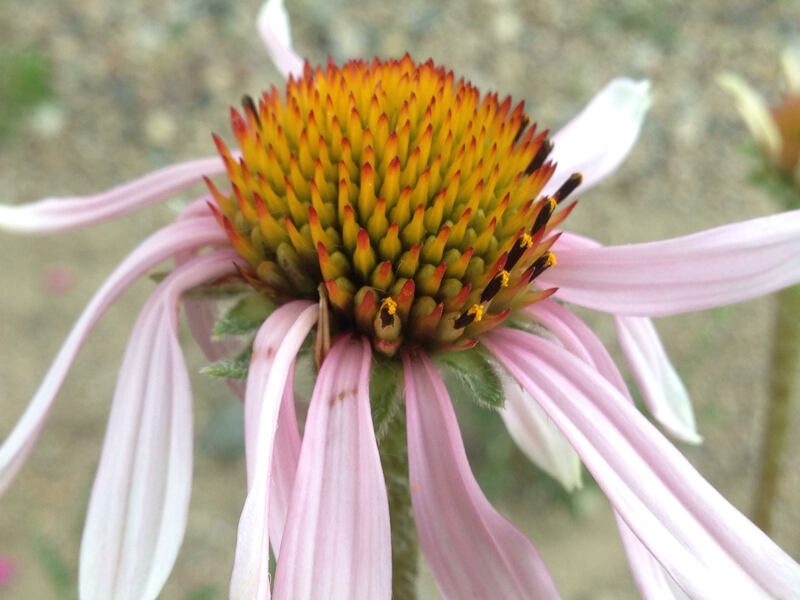 The oldest Echinacea plants in experimental plot 1 will turn 20 this year. They are part of the 1996 cohort, which was planted in a common garden experiment designed to study differences between remnant populations and assess life history traits as they grew. 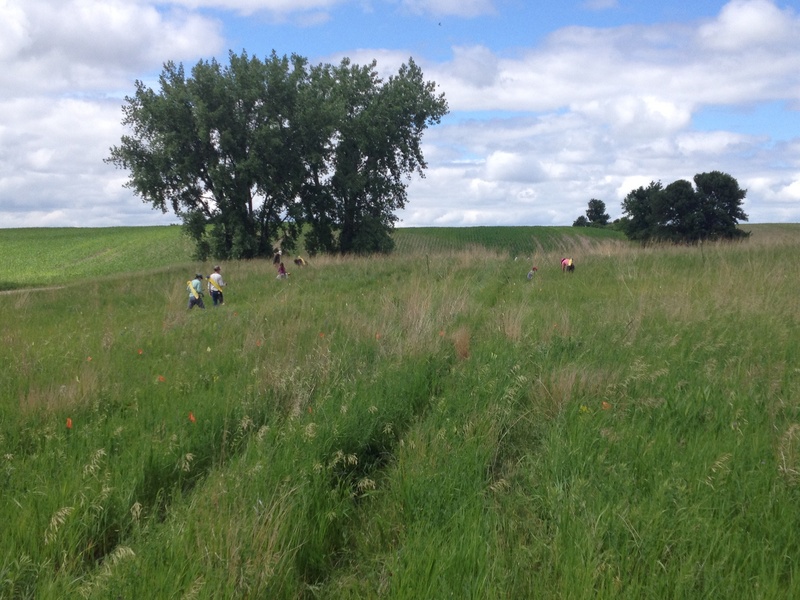 Stuart sampled about 650 seeds (achenes) from eight remnant populations in and near Solem Township, representing the range of modern prairie habitat from small patches along roadsides to a large nature preserve. In 1996, he transplanted seedlings on a 1m x 1m grid, randomly assigning the location of each individual. 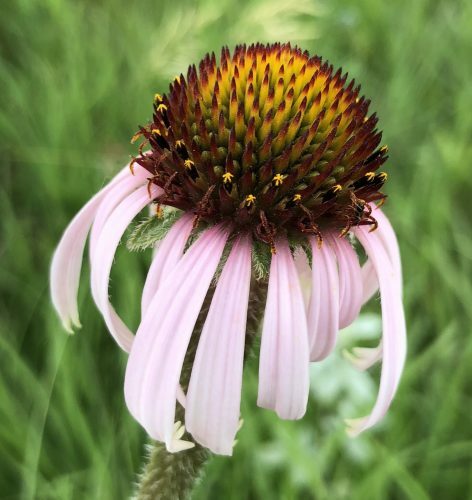 Every year, members of Team Echinacea assess survival and measure plant growth and fitness traits including plant status (whether it is flowering or basal), plant height, leaf count, and number of flowering heads. We harvest all flowering heads in the fall and obtain their achene count and seed set in the lab. Of the original 650 individuals, 304 were alive in 2015. This year, 136 individuals from the 1996 cohort were flowering with a total of 303 heads. At present, these heads are in the lab where they await processing to find their achene count and seed set. 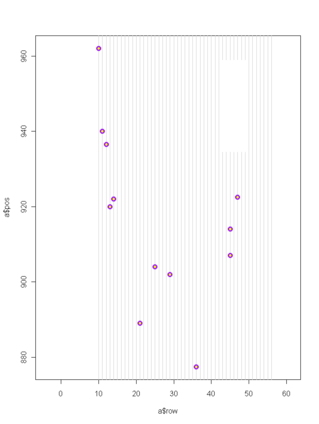 We used 31 plants (45 flowering heads) from the 1996 cohort as maternal plants in crosses for the most recent heritability of fitness experiment (qGen3). We also used five plants from the 1996 cohort (8 heads total) as part of the pollen exclusion and addition experiment. We covered their heads with pollinator exclusion bags for the duration of the season. Read more posts about this experiment. In 2012 we plan to measure in “review mode” (as we did for CG2 in 2011) — all location records will be on the Visors with Status=”Staple” or “Skip” populated. We should not spend as much time searching for plants that have not been present for 3 or more years.This should speed up measuring. I’ll post the planned 2012 protocol next. Now that we’ve inventoried all the CG1 heads, I checked to see just how many we have. There were about 3009 twist-ties put out, and 119 heads were duds or missing, so our (estimated) total number of good heads is about 2890. CG2 had something like 140 heads, but we haven’t inventoried those yet. Here’s a map of unharvested head locations in the main experiment (there’s one more head in the 99S garden).